First Sentence: The Alchemist picked up a book that someone in the caravan had brought. Reason for Reading: This is a book that came recommended by several different people, however, it was one of my pen pals’ recommendation that finally made me decide to purchase it. I chose to read it when I did because it was the book calling to me the loudest from my shelves of books waiting to be read. From the Publisher: Paulo Coelho's enchanting novel has inspired a devoted following around the world, and this tenth anniversary edition, with a new introduction from the author, will only increase that following. This story, dazzling in its powerful simplicity and inspiring wisdom, is about an Andalusian shepherd boy named Santiago who travels from his homeland in Spain to the Egyptian desert in search of a treasure buried in the Pyramids. Along the way he meets a Gypsy woman, a man who calls himself king, and an alchemist, all of whom point Santiago in the direction of his quest. No one knows what the treasure is, or if Santiago will be able to surmount the obstacles along the way. But what starts out as a journey to find worldly goods turns into a discovery of the treasures found within. Lush, evocative, and deeply humane, the story of Santiago is an eternal testament to the transforming power of our dreams and the importance of listening to our hearts. 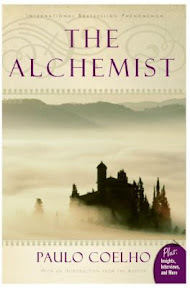 Comments: The Alchemist is the tale of a young Andalusian shepherd who sets out on a journey to follow his dream. The shepherd, Santiago, travels through Spain into Africa, crosses the Sahara Desert to reach the Pyramids of Egypt in hopes of finding his unknown treasure. With encouragement and help from several different people along the way, including an alchemist who helps Santiago listen to his heart and realize his dream. Such a simple book and yet such a deep lesson about hope, love, conquering fear, and striving to be the best a person can be. It is also a story of interconnectedness—between people as well as the life around us. Upon finishing the book, I understand what the publisher Harper Collins meant when it referred to the book as being like “getting up at dawn and seeing the sun rise while the rest of the world sleeps.” That’s truly what it feels like. Favorite Part: I think my favorite scene in The Alchemist is when the main character is talking with the desert, the wind, the sun and “the hand that wrote all.” It was a revelation for the reader as well as the characters in the book.